George Curry grew up in the coal-mining town of Larksville, Pennsylvania. He attended St. John’s Parochial Elementary School and then Larksville High School. George Curry received a football scholarship to Temple University, where he earned his B.S. Degree in Social Sciences. He attended the University of Scranton, where he received his Master’s Degree in Administration and Supervision. He became the winningest coach in Pennsylvania history with 455 wins, 6 State Championships, and 3 National Champions (USA Today). Coach Curry was all about education and getting millions of dollars in scholarships for his players. Curry was proud of the fact that 78% of his football players who have gone on to higher education have graduated (that is higher than the non-athlete graduation rate). Coach certainly got his players ready for the world. He taught commitment, accountability, leadership, and work ethic. He was also a stern disciplinarian. The players bought into his style! 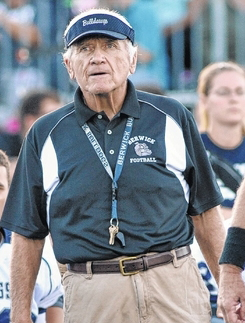 His overall coaching stint, included four (4) years at Lake Lehman High School, thirty-eight (38) years at Berwick High School, and three (3) years at Wyoming Valley West High School. He coached 12 regular season undefeated teams and had a 47 game regular season winning streak from 1981 to 1985. Curry was named “Coach of the Year” 28 times. The Berwick Bulldogs were named USA Today National Champions in 1983, 1992, and 1995. Curry also coached 13 teams that were ranked in USA Today. Curry coached the Dawgs to Pennsylvania’s first ever State Championship (15-0-0 season). Most of Berwick’s wins during the Curry era came against schools larger than Berwick. Curry and his wife of 48 years, Jacqueline, have four children and six grandchildren.